Looking for the best 2018 Black Friday & Cyber Monday Canon EOS 6D Mark II deals, sales, rebates and specials? Here is the buying guide for you! Designed for enthusiast photographers, the Canon 6D Mark II makes numerous advancements over its predecessor to improve upon every aspect of image capture and creation, including a 26.2MP CMOS sensor, DIGIC 7 image processor, 45-Point All-Cross Type AF System and Dual Pixel CMOS AF – making it great for challenging low-light situations as well as landscape, portrait and event photography. In addition, Canon EOS 6D Mark II DSLR camera achieved a great 80% overall score at DPReview and it is ideal for budding photographers looking to take their creative DSLR photography skills to the next level by shooting with a Full-frame CMOS sensor DSLR camera. So just get it this holiday shopping season! $500 off + Free Battery Grip and Accessories on Canon EOS 6D Mark II with Printer Bundle: (after 350 MIR) $1,299 at B&H, Adorama, with 24-105mm f/3.5-5.6 Lens: $1,699at B&H, with 24-105mm f/4L II Lens: $2,199 at B&H, Adorama. 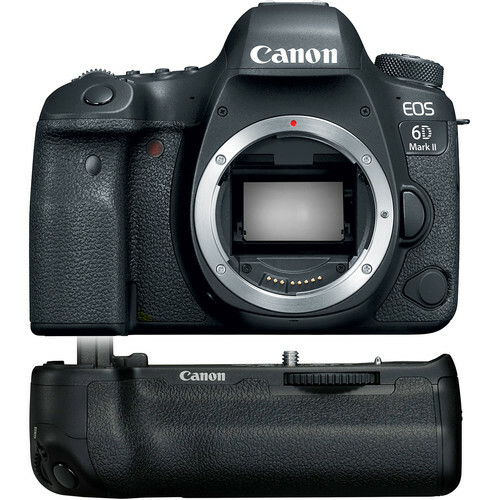 $500 off + Free Battery Grip on Canon 6D Mark II Body: $1,299 at Amazon, B&H, Adorama. $700 off + Free Battery Grip on Canon 6D Mark II with 24-105mm f/3.5-5.6 Lens: $1,699 at Amazon, B&H, Adorama. $700 off + Free Battery Grip on Canon 6D Mark II with 24-105mm f/4 Lens: $2,199 at Amazon, B&H, Adorama.